Stunning hand-tied bouquet in pinks and reds with lush green foliage. guaranteed to make them smile..
Lilac's, Purples and creams are the star combination in this aqua pack hand-tied. Roses take th.. 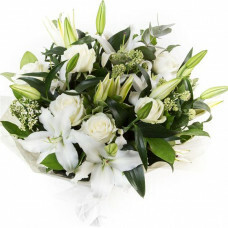 This Gorgeous ' Luxury ' Selection of Fragrant Large headed white oriental lilies together with the .. This is a truly spectacular combination of large-headed roses and elegant Oriental lilies. It’s a po..
Have a fun filled time made especially special with flowers. The sweetest flower bouquet is made wit.. Perfect gift for Mum on Mother's day, A selection of cerise pink and purple lissianthus, pink ..